This is a re-post from Julia Kirby, who is Editor at Large for Harvard Business Review. The abrupt departure of Time Inc. CEO Jack Griffin after less than six months on the job has the media world buzzing. Now, to be sure, the media world likes nothing better than talking about itself, so the story is probably getting more play than it would if he’d been ousted from a job in the, say, cement business. But that’s just as well, because in it is a cautionary tale for new leaders in any industry. 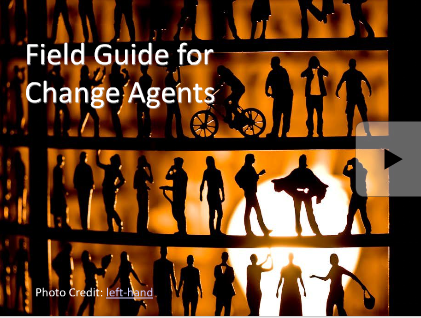 [The change agent,] that’s become a common label, especially in an era when so many traditional business models need rethinking, but run a Google search on it and you will begin to appreciate the special challenges it creates. What immediately becomes clear is how it raises hackles in an organization; the term is quoted with irony, or upon someone’s departure, more often than not. It would appear that nothing guarantees more schadenfreude on your departure than having arrived as an agent of change. Avoid the term “change agent.” The strange thing about Griffin’s case is that he appears to have applied this “kick me” sign to himself. In most cases, it’s the board that puts the word on the street that a change agent is coming. Try to keep that from happening. It’s not as though the organization won’t hear the news, and it’s insulting. It casts veteran managers as part of the problem, not forces for positive change themselves. As one Time Inc. veteran complained to me, “it’s not as though all of us had just been sitting on our thumbs.” That is a classic, and predictable, response. Gauge the internal hunger for change. It’s one thing to be the agent of change in an organization that realizes it needs it; it’s quite another when you’re the only one in the room convinced of that. A big problem at Time, at least as far as Griffin was concerned, was that there was no such sense of a burning platform. People, therefore, would perceive any change as being done to them, not for them. It’s not impossible to take a comfortable organization and get it excited about a quest, but it definitely affects how you should frame the mission. Go directly to “us”. As leadership expert Steve Reicher and his colleagues convincingly argue, great leadership involves tapping into the psychology of “us” versus “them.” This means that job #1 for a leader is to go native, immediately taking the side of the organization, uniting it against a common enemy, and building consensus on what “we” should do. From this perspective, it’s clear how the work of anyone fighting the status quo is fraught with the potential to be misread. Ask yourself honestly whose side you are on — and if it’s not your organization’s, don’t blame them for hating you. Act as catalyst not cattle prod. Chances are, there is change energy to be tapped in the organization at some level. To get at it, think first of what might be holding it back, and address those things. As in chemistry, a catalyst lowers a barrier to effect a transformation — it doesn’t apply a shock. Surround yourself with new friends. Of all the new-manager missteps Griffin is accused of, probably the worst is his decision to surround himself with cronies. It’s an understandable temptation, when you don’t yet know your new colleagues well enough to say who’s brilliant and trustworthy, to just recruit some folks you already know to have those qualities from past experience working with them. But nothing — nothing — is more alienating to your inherited team than to suddenly be on the outside of the inner circle looking in. It doesn’t help that, in Griffin’s case, the cronies were also perceived to be carbon copies of himself. This entry was posted in Uncategorized and tagged catalyst, Change, change-agent, vision by Gregg Caruso. Bookmark the permalink.